Polaroid Eyewear has partnered with American Paper Optics for the launch of a new generation of curved 3D glasses - "Polaroid Premium 3D Glasses". The Polaroid Premium 3D Glass Collection consists of 3 custom frames with precisely curved circular polarized lenses allowing moviegoers and passive TV viewers to fully experience 3D with an uncompromising field of vision and a pair of glasses to match their personal style. Prescription lens wearers are not forgotten with our new premium 3D COVER style that fits comfortably over any optical frame. -	The frames and specially formed lenses create an extended field of vision. -	High quality lightweight frames designed for extended wear. 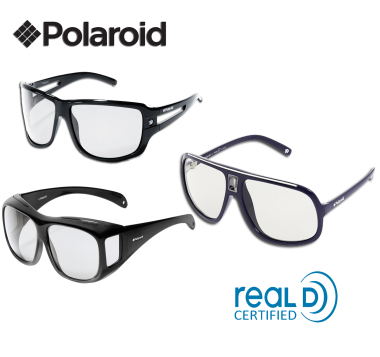 Polaroid's premium passive 3D glasses are certified by RealD™ due to high quality and lens efficiency for usage with RealD™ technology screens and other passive polarized TV's and devices.